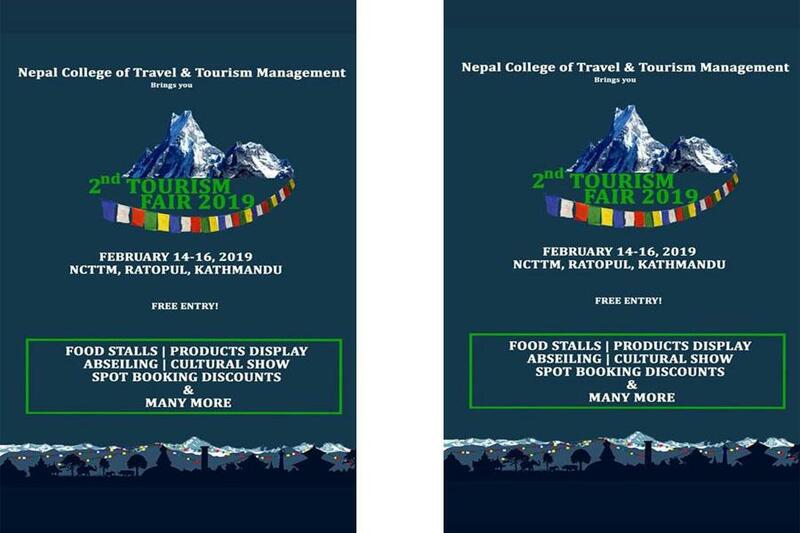 KATHMANDU, Feb 08:Nepal College of Travel and Tourism Management(NCTTM) college has organized 2nd Tourism Festival from February 14, 15 and 16 to promote tourism development and to create awareness among tourists. Last year also the college and their students conducted tourism festival which was very fruitful that's why they are planning to conduct this event again. The main goal of his event is to create awareness among the citizens of Nepal about tourism and its importance in the development of the nation. Government all alone cannot make this possible so the locals have to come forward and to have development of tourism in our country. Likewise, there will be participation of various tourism organizations and entrepreneurs in this event and different stalls will be kept in order to attract tourists by making them aware of the unique features of Nepal including Paragliding, wall climbing, trekking, abseiling, rafting and others. Similarly, stalls of different Nepali cuisine will be kept there. The organizing committee are hopeful that this event will be as successful as last year's event. Also, they have declared that this event will be conducted every year as the college itself is connected with the tourism sector of Nepal.